How Does Ignorance Imply Godliness? 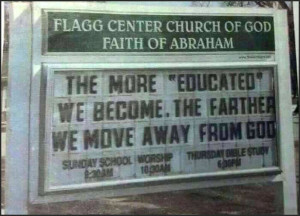 Does faith fail with education? This church understands the demographics of its target audience. It validates “argumentum ad ignorantiam.” The lower the education of its flock, the greater its profitability and control over those minds. 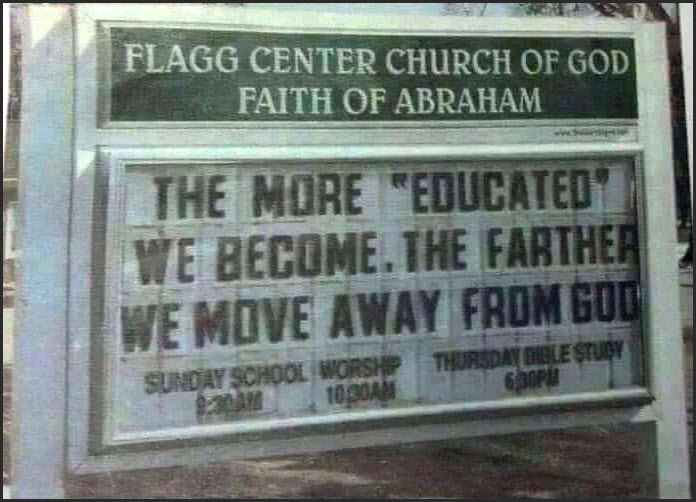 “Education” is represented almost as a sin itself, as being “farther” from God, because of it. Ignorance, in matters of faith, is expressed as a virtue. This, of course, explains just about everything when it comes to religion. But it gets deeper. There are those who invest a lot of thought into defending their religion, so they are not necessarily “ignorant” in terms of their ability to think! They are called Apologists. And I’ve had the pleasure of a lengthy discussion with such an apologist at the Christian Apologetics Alliance on Google+. As a Moderator of the group, he exhibits a good understanding of apologetic thought and strategy. After receiving the answers to my inquiry, the conversation morphed into several categorical topics, but something ALWAYS remained clear. To the apologist, it is not necessary that a defended position be true, but only that it be defended as not necessarily false! So, inference is the typical strategy for defending a position, but such a tactic requires plenty of, (albeit sometimes convoluted or circular), thought! So it’s not really fair to associate “stupidity” or “ignorance” or “gullibility” or any sense of unintelligence with belief in the supernatural, or superstition. But as a matter of how one goes about defending a position; it is little wonder that scientists (grounded in the scientific method) are far less likely to be superstitious or highly religious. This is a quality of thought issue, not necessarily an “ability” of thought issue. To the apologist, conclusions may not be verifiable, because they are apparently “outside” of our ability to demonstrate. This leads to virtually any claim being as valid as any other. (Islam or Christianity? Buddhism or Judaism? One God or many gods?) Without the ability to verify, truth can only be asserted without proof or demonstration. One story is as good as another, especially when the magic of the “supernatural” can make anything possible. What makes for a poor explanation is the inability to verify! And the more educated one becomes, the more likely they are going to seek verification to extraordinary claims. Where knowledge grows, God recedes. Where ignorance grows, God is inserted to fill the unknown, and increases. (See: God of the gaps.) This process happens with the uneducated flock, as well as with the educated apologist. Whatever is not known is relegated to God (or, God did it). Isn’t Consciousness An Emergent Property? Is Jehovah right, or Allah? Does Jesus Really Save Us From an Eternal Hell? In Constant Prayer: Does God Answer Them? Why Doesn’t God Just Make Himself Known to All?